The dark form of a Sitticus pubescens jumping spider feeds on felled prey. Sometimes the shadows created by the rigid placement of my flash don’t work to great effect: they can be heavy to the point of distracting or distorting. In this case given the position of the (unidentified) prey, where it is seemingly getting lost in the darkness between the bunched up pedipalps and legs, I think it worked out well. Looking at it now, it might be a good candidate for a monochrome version; I may have to revisit this one. Incidentally, speaking of flashes, I’ve got a new one heading my way and a friction arm to go with it, to give me more options on flash placement, so I can make these kinds of heavy shadows more of an intended effect rather than an unavoidable one. Looking forward to breaking out the camera again — it’s been too long! 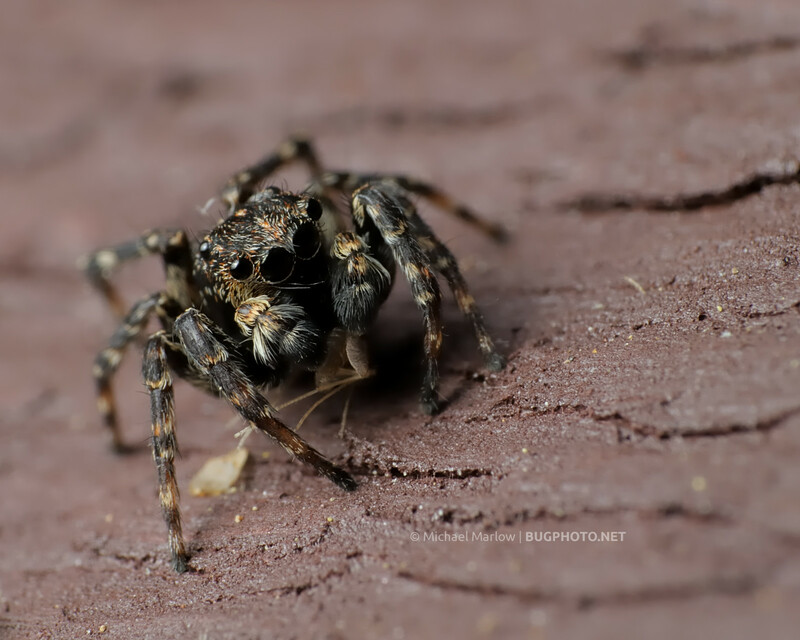 Posted in Jumping SpidersTagged artistic choices, big eyes, dark side, flash, flash photography, Macro Photography, predator and prey, Salticidae, shadows, Sitticus pubescensBookmark the permalink.